In this article I will guide you in discovering the town of Luang Prabang, a wonderful village in colonial style located on the banks of the Mekong River, Laos. 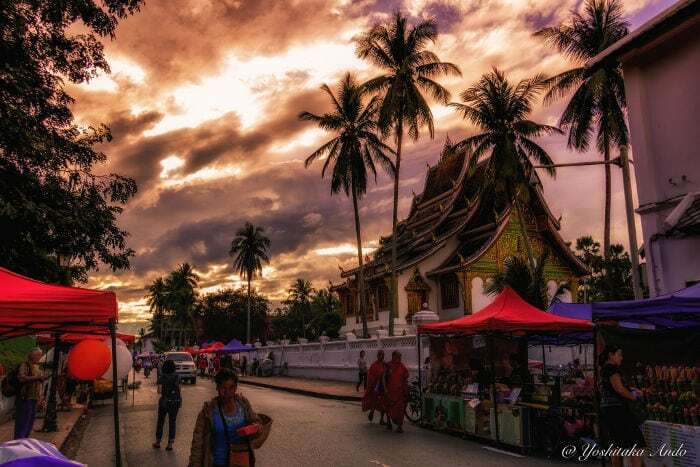 Luang Prabang is a small city located 390 kilometers north of the capital, Vientiane famous for its Buddhist temples, its waterfalls and night market, and peaceful days where not even a leaf moves. The sensation you’ll have when you enter the town is that it is a completely different place compared to the rest of Southeast Asia, simliar only perhaps to Bagan in Myanmar, as far as atmosphere goes. And just like Bagan, Luang Prabang too has been classified as a UNESCO World Heritage Site (in 1995). The city’s size and population (50,000) isn’t very big, when compared to other Asian towns like Chiang Mai (150,000). Up until 1975, when the communist party overthrew the monarchy, despite not being the capital, it hosted the royal residence. Just like the rest of Southeast Asia, Laos too is hit by monsoons during the rainy season. So I recommend that you visit the country between October and the beginning of April, so that you can fully enjoy outdoor activities like visiting various waterfalls or taking a boat tour on the Mekong River. Though Laos is a communist country, the importance of this ideology isn’t very visible outside of the capital Vientiane, where instead the communist symbols are visible to all. Something I recommend that you pay attention to is the sale of all sorts of drugs. Both in Luang Prabang, and in even smaller and more isolated towns (you’ll notice this if you take a boat tour on the Mekong and stop in Pakbeng), you’ll be approached by people looking to sell you drugs. Despite being advertised as something the government doesn’t really care about, using drugs is strictly prohibited throughout the country and is punishable by death. Cities like Vang Vieng sold food and drink containing hallucinogenic mushrooms, marijuana, and opium. Up until 2012 in fact, the city was considered to be the drug and wild party capital. In the last few years though, clubs that offer the so-called “happy menu” have been closed due to the number of dead teens who have died by jumping into the river under the effect of various drugs. 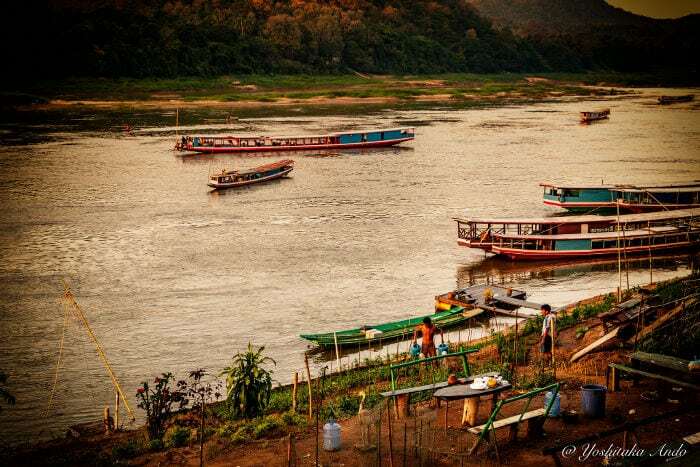 Thanks to the expansion of tourism that the city has undergone starting with its opening in 1991, Luang Prabang is easily reachable from many countries via various means of transport. As was mentioned before, the cities are separated by a little less than 400 kilometers. Though it isn’t a great distance, the precariousness of the roads makes this route a challenge at high speed. So if you decide to get to Luang Prabang from Vientiane by bus, you’ll need a lot of patience and be prepared for a mountainous road full of curves. It will take you between 10 to 12 hours of travel, depending on the traffic and mood of the driver. There are two types of buses you can take: regular lines or VIP. For 20 USD you can take a VIP bus, which has air conditioning, a few snacks (bring yourself something to eat and drink just to be sure) and assigned seats, so you’ll have a guaranteed place to sit. Buses leave from the north station of Vientiane, located two kilometers from the city center. To get there you can take one of the many tuk tuks that can be found across from the hotel. Once you get to the station you can choose if you want a bus that goes directly to Luang Prabang, or opt to take one that will first stop in Vang Vieng. If you decide to take a regular bus line, used also by locals, the ticket price will be less than 20 USD. On regular bus lines there is no air conditioning and you won’t be assigned a seat. It is however an interesting experience, especially if your stay in Asia is mid-to-long term and you can then travel more calmly. In this case too the travel times are rather long, from 12–14 hours, but you’ll have the chance to come into contact with the habits and customs of the local people. All VIP buses also travel by night, so if you don’t feel like spending the entire day on a bus, you can also take a night run. Prices are the same as VIP buses that travel during the day, but have the advantage of reclining seats. Usually you’ll also be given a blanket for the night, but I recommend that you dress warmly in view of the Asian custom of setting the air conditioning to arctic temperatures. Departure times for buses vary according to their category. Regular bus lines travel daily from 6:30 to 19, like VIP buses. Night buses leave at 20. Once you get to the Luang Prabang bus station, you can take a tuk tuk che that will bring you to your hotel for a few USD, normally from 3 to 5 USD. The second option for getting to Luang Prabang from Vientiane is to take a flight. Domestic flights are mainly run by the national carrier: Lao Airlines. From the airport in Vientiane there are three daily flights (with jets and prop planes) for Luang Prabang: at 9:10, 11:30, and 12:00. the flight time is 50 minutes, and a one way flight will be around 120 USD a person. Another Lao airline that offers flights from Vientiane to Luang Prabang is Lao Skyway. Ticket prices are lower; you can get to Luang Prabang for just 60 USD. Direct domestic flights for Luang Prabang are also available from Pakse (in the south of Laos), with Lao Airlines, for a price of 500 USD. The Vientiane-Wattay international airport is located about 13 kilometers northwest of the city, easily reachable by a 6 Dollar trip by taxi. In recent years, and thanks to the economic development that is slowly gaining a foothold even in Laos, the capital Vientiane is developing its international routes to Australia, China, New Zealand, Thailand, the Philippines, Japan, Vietnam, and many more (a complete list is available on AirAsia.com). Getting to Laos from the north of Thailand is very easy and inexpensive, especially if you’re in a city like Chiang Rai, which is just a few kilometers from the border. After taking a bus line that leaves from the Chiang Rai bus station and getting to the border with Laos, you’ll have to pass through customs, first that of Thailand and then that of Laos. Regarding Thai customs, if you have a tourist visa of 30 days or more, or you want a multiple entry visa there won’t be a problem. If instead you have a single entry visa (such as a student visa), and want to get an exit visa that will allow you to re-enter the country without losing your current visa, this is where the trouble starts! This application for an exit visa is in itself quickly handled in practice, or should be in cities like Bangkok. However Thai officials at the border with Laos aren’t clear on what procedure to follow to issue an exit visa. In my case I had to help the official to fill out the form with all the necessary information (from which border post I was leaving, the date and time, etc), and explain to him by signs the reason why I wanted an exit visa, why I was living in Bangkok, what social networks I used, and many other questions of this nature. After a good hour and a half I managed to get an exit visa from Thailand and get my passport back. My advice is therefore to apply for an exit visa in a city like Bangkok, where as soon as you get to the immigration office they know what to do and in just a few minutes you get your visa without much delay. Once you get through Thai customs, you’ll get to the Lao side. Just as in Thailand in Laos too you need an entrance visa. I imagine you’ll have a tourist visa, which is easily obtained. Some nationalities, like the Swiss for example, can stay in Laos for two weeks for free without applying for any type of visa. If you have an American passport (or most other pasports) you’ll need a visa at a cost of 30 USD. Your visa can be applied for ‘on arrival’ directly at the Lao border, or by going to any Lao embassy, such as in Thailand (Bangkok). There is no Laos diplomatic missions in most countries, US, UK, Australia, Germany and France have it. Once you get to Laos, you’ll have to go to the nearby city of Houayxai, and take a boat headed to Luang Prabang. The ticket price is about 15 USD a person. It will take about 14 hours to get to Luang Prabang, divided over two days. Remember that the boat at the port of Houayxai leaves just once a day, at 11 in the morning. I recommend then that you depart from Chiang Rai early in the morning, or spend the night in Houayxai and book tickets as soon as you get into Laos, since this tour is very popular especially among backpackers. This “cruise” will give you the opportunity to travel on the Mekong River and see the beautiful untouched landscapes that surrounds it. The schedule that a standard cruise offers is to travel for 7 hours, arriving at the town of Pakbeng, spending the night there (you’re responsible for your hotel stay), starting again the next morning at 10:00 a.m., and arriving at Luang Prabang around 4:00 p.m.. Besides this standard route, other companies also offer this tour. The difference is in the price and comfort level that you will be offered. As opposed to the basic cruise that starts at 15 USD, where you’ll be seated on wooden benches and you have to bring your own lunch, companies like Shompoo Cruise offer trips where you can have small beds to lay out on, seats with little tables where lunch will be cooked by the boat’s staff, and much more for prices starting at 70 USD a person. Personally I recommend that you spend a little more and opt for a personalized cruise such as those offered by Shompoo Cruise, to fully enjoy the calm atmosphere that only a trip on the Mekong can give you. An interesting aspect of these more luxurious cruises is the chance to stop in various villages that are along the river. You can see how local people live, play with children, and also bring important items such as food and clothing. With the cheapest boat tour (from 15 USD) instead, it’s highly probable (as happened to me!) that the boat will be packed with people, and you won’t be able to enjoy the trip even for a moment because you’ll be surrounded by partying teens with loud music that goes on uninterrupted for 7 really long hours. Another type of boat that covers this route are the so-called speed boats. These boats have an elongated shape and can take 3–4 passengers at a time seated in single file. This option takes 6 hours of travel to Luang Prabang in just one day; imagine though the high speed and danger of these boats, it isn’t for nothing that you’ll be given an actual motorcycle helmet for the trip. Another option is to take a flight from one of Bangkok’s two airport, depending on the airport you wish to take. If you’re looking for the lowest pricing, I recommend that you look at the deals offered by AirAsia, or NokAir. Round trip tickets are around 5,000 THB a person; this price is probably also due to the fact that there’s only one daily flight from Don Muang airport to Luang Prabang. If instead you want a connection from Suvarnabhumi Airport, so as to get to Laos directly without going from one airport to another, then it’s best to choose airlines such as Thai Airways or Bangkok Airways. In this case the price of a round trip ticket is 6,000 THB for a two hour flight. There are no flights however directly from Europe going to Luang Prabang. You can however make a stop in Bangkok. During recent years Chinese tourists have been an important factor in Laos’ development, not just in Beijing’s investments in Lao dams, but also in its tourism infrastructure. Since China is an immense country, you can get to Luang Prabang from various regions. For those who live in cities like Shanghai for example, there are daily flights from both of the city’s airports (Hongqiao and Pudong). There are no direct flights though, so you’ll have to make a stop in Kunming. Both routes take five hours (plus two hours of stopover) with China Eastern Airlines, at the price of about 400 USD a person. Besides China Eastern, you can also take a low cost airline like AirAsia. There are four connections between Luang Prabang and China: Changsha, Chengdu, Guangzhou, and Shenzhen. Unfortunately in this case too there are no direct flights; flights from Chengdu for example, stop in Kuala Lumpur for 12 hours. Like Shanghai, other Chinese metropolises like Beijing, Chongqing, and Tianjin also offer flights to Luang Prabang by making a domestic stopover. Other than by air, you can also get to Laos from China by bus, from Yunnan. If you want to travel from China by land to then enter get into Laos and Luang Prabang, I recommend that you take the Kunming–Luang Prabang route, which takes 24 hours, for a price of 60 USD. This type of bus offers beds for sleeping; except for those that leave early in the morning (at 7) from the south station of Kunming. 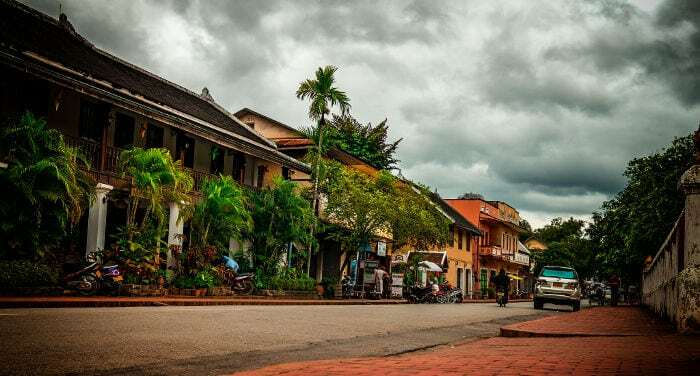 This route also passes through cities like Pu’er and Yuxi, giving those who live in these areas the chance to also get to Luang Prabang by land. There are only three buses a day that go from Vietnam to Luang Prabang. These buses leave from different cities: Hanoi, Vinh, and Hué. Buses from Hanoi and Vinh leave at 18, while the one from Hué leaves at 17:30. The travel times will be 24, 19, and 30 hours respectively. Prices range from 30 to 55 USD a ticket, depending on the distance. Personally I took the Luang Prabang–Vinh–Da Nang route. I can assure you that it’s a terrible trip in many ways. Despite the fact that Vietnamese buses offer little beds (in bunks) where you can sleep, you won’t get any rest; the bus will continually stop every two kilometers to let local people on who have not booked a bunk and will sit on the ground between one bed and another. Or when the bus is really full, you’ll be standing right next to what should be your bed. It’s a frustrating situation. Above all, the Vietnamese, not being known for their calmness and gentleness, will speak loudly to the point of shouting for interminable hours. If you want to book the bus tickets in advance, Baolau or 12go.asia are the two agencies that we recommend for booking tickets in South East Asia. The best choice you could make is to take a flight from one of principal Vietnamese cities to Vientiane and from there take a VIP bus, or fly to Bangkok and from the Thai capital fly directly to Luang Prabang on AirAsia. There are more than 250 guesthouses and luxury hotels in Luang Prabang. The best area is definitely between the market and the shores of the Mekong. In this part of the city, besides being near all the monuments, you also have a vast choice of great value hotels. Both in low and high season, you can go in person to the reception and renegotiate the price. A hotel with clean rooms, a balcony where you can have breakfast (included in the price), laundry service in two hours, and the possibility to rent motorbikes and bicycles, is Villa Champa B & B. Family run (a Lao and Vietnamese mix), this delicious Bed & Breakfast will further allow you to taste the magical atmosphere of the city. The beautiful landscapes that Luang Prabang can offer are infinite, all you have to do is rent a scooter and sit along the banks of the river to watch the sunset to understand the magic atmosphere of this town. Visiting the city on foot is convenient enough, even so I recommend that you rent a motorbike (14 USD a day) or a bike (3 USD a day). There are a good 32 Buddhist temples, all inside the city center: a 250 meter wide peninsula a kilometer long delineated by the Mekong River on one side and the Khan on the other. One of the prettiest temples is Wat Xieng Thong,a very colorful complex of Buddhist temples, famous for its mosaic of the tree of life on one of its walls. Another interesting temple to visit is Wat That Luang. Also called the monastery of the royal stupa, because inside it holds the ashes of the last king of Laos, Wat That Luang is famous for its statue of Buddha weighing over 600 kilograms. Besides seeing the many temples spread around the city, if you’re interested in the Buddhist culture, I recommend that you get up early in the morning and go to the main road in the center of town (where they hold the night market) to witness the procession of monks, which begins at 5:30. This Buddhist rite consists in the passing of monks of all ages, of whom are offered food. Close to the road where they hold the night market, is the Royal Palace. Built in 1904 and no longer in use since 1975, when the monarchy was abolished, since 1995 the royal palace has opened its doors to the public as a museum. An important statue inside the museum is a 83 centimeter high Buddha made of pure gold. Visiting hours are from 8:30 a.m. to 11 a.m., and 1:30 p.m. to 4:00 p.m., and the entrance fee is 2 USD. If the activities in the center of town are limited to walking, visiting temples, a few moments to relax in one of the various spas, and the night market which is held every evening on the main road of the city, outside the city limits there’s another world to discover. Rent a scooter and lose yourself among the marvelous landscapes that front the Mekong. Among the places that are not to be missed are the Kuang Si falls, located 30 minutes by car from the center of Luang Prabang. This natural park can also be reached with a scooter, the road isn’t the best due to holes in the asphalt, tight curves and animals that suddenly cross the road, but it can be traveled. The best time to go is the morning, when there’s less people and the organized tours haven’t yet arrived. Once you’ve parked your motorbike in one of the paid spaces at the entrance of the park, you can go to the main entrance (this too has a fee). In the beginning of the park you’ll find a little zoo that houses bears saved from hunters. Going to the left you’ll start to see the first level of the falls. If you keep walking, after ten minutes you’ll get to the highest of all the falls that is also the most popular for photographs. For the more daring, you can also go to the top of the falls via a staircase in the forest found to the left of the waterfall. Once you get to the top you can take a dip in the natural lagoons carved from the rock, and admire a panorama of the waterfalls 30 meters below. Besides these waterfalls there’s also Tad Sae. Unlike Kuang Si falls, which can be reached by motorbike or renting a tuk tuk, Tad Sae falls can only be reached by boat. You’ll have to go along the Khan River to the dock where boats leave and from here rent one that in a few minutes will get you to the entrance of the falls. Much smaller than that of Kuang Si, this park too offers beautiful waterfalls over different levels. There are also three restaurants inside and an elephant village. A particular place that deserves a visit are the Pak Ou caves. The distinction of these caves is that they are full of statues of Buddha of various sizes and materials. In total there are 4,000 Buddhas going back thousands of years ago. The caves are located about 25 kilometers from Luang Prabang. You can get there with a motorbike but the road will be really “wild”. They are all unpaved roads, so if it rains they become dangerous and almost impossible to ride on. If you like adventure it is quite an experience, also because the road toward the caves goes through many villages, and you can see a glimpse of the real everyday life of the Lao people. Once you get to the boat dock, you’ll have to rent one that will bring you to the other side of the river to see the caves. The price is usually 3-4 USD a person. I also recommend that you take a tour of the village near the dock where the boats leave. I don’t recommend that you eat in the restaurants that face the river, the food isn’t all that great and the prices are definitely higher for tourists. One of the most beautiful festivals that you can attend in Southeast Asia, and in Luang Prabang in particular, is the lantern festival: Loy Kratong. These festivities take place toward the end of October, and the whole city participates by building actual boats of paper mache in the shape of animals, gods, etc. All the city’s temples are decorated with lots of candles and colored lanterns, and in the evening the younger monks place the boats in the Mekong River. The boat that goes the farthest wins the competition.